Having read through most of the book now, I'd highly recommend it to anyone interested in Muslim women's expression of faith in the UK. I was especially interested in the section where Tarlo discussed the famous case of Shabina Begum, who wanted to wear a jilbab to school. You can also check out Muslimah Media Watch's review of the book here. Salaam..Just wondering is Emma Tarlo a Muslim herself? Nothing loaded in that question; would like to see Muslim women discuss the hijab phenomenon with hadith too -- it was said that hijab would become a clothing and a garment to be worn. We need to look into the deeper meaning of it, inshaAllah. 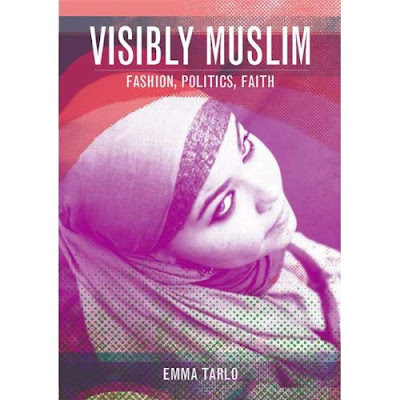 Salaam Anon, Emma Tarlo is not Muslim as far as I know, but in a way, that gives her an ability to provide an 'outsiders' view of hijab and those who wear it, as a Muslimah is bound to be biased by her own personal opinion and experiences of hijab. Also, I disagree that we 'need' to look 'deeper'; that is exactly what has been done over and over again by Muslims. A quick scan of the internet will show you endless articles, talks and videos about hijab in Islam and it's supposed purpose and form, wheras is it very rare to come across anything which looks at the reality of hijab and those who wear it. We certainly don't need another lecture about the (very few) instances that hijab gets a mention in Islamic texts, or how it is somehow the be-all and end-all of a Muslim woman's character. And I'm not sure what you mean by 'it was said that hijab would become a clothing and a garment to be worn'. Who was this said by and when? hopefully it would be available on Amazon soon. if you want to read a good book on hijab written by a Muslim woman, then you should read "Rethinking Muslim Women and the Veil", by Khatherine Bullock. The author is australian and the book is the outcome of her PhD thesis. I bought and read the book and was disappointed. it read more like a doctoral thesis by an non-Muslim who at times took on a condescending attitude toward Hijabis that I found offense. Anyway, that's how I viewed the book. I'm sure it would be a good source for research or text. I have to add another positive vote for Katherine Bullock's 'Rethinking Muslim Women and the Veil'. I found it far from condescending. To balance the academic angle there's a chapter focusing on personal experiences of hijabi women in Toronto. The book is written in plain language in a discursive style. I liked the fact that it wasn't preachy and covered the diversity of reasons women themselves gave for why they wore the hijab. I think it's the best book I've read on a much-exhausted subject.